GetDouble.online Review | Bitcoin Doubling Scam Exposed! 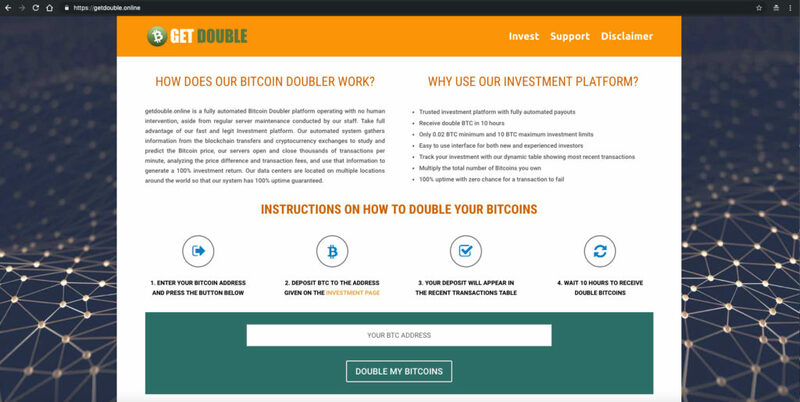 Get Double (GetDouble.online) is the latest cryptocurrency investment scheme to fester within the Bitcoin arena. Claiming to double an investors initial Bitcoin investment within 10 hours is lunacy, to say the least. As you will learn, Get Double is a rather cut-and-dry site. To find out more regarding this newly established Ponzi scheme, we invite you to read our unbiased review. GetDouble promotes their platform as a fully automated Bitcoin doubling platform that requires zero human upkeep or intervention. Their automated system is said to function by gathering information from blockchain transfers and cryptocurrency exchanges to study and predict the Bitcoin price. Every minute the GetDouble system allegedly monitors and executes thousands of transactions to take advantage of price deviations. Supposedly, their data centers are located at multiple locations across the world although no identifying information as to where these servers are are disclosed. The minimum Bitcoin investment to get started is 0.02 BTC. The maximum deposit offered is 10 BTC. These deposit requirements are set forth and required to help investors avoid fees, while according to their FAQ there is no limit as to the number of accounts you can have. Their site claims that their system has 100% up-time with zero chance for a transaction to fail. Who is Behind Get Double? GetDouble.online does not provide any ownership or operator information. No identifying information such as a physical address, telephone number or corporate entity are rendered. The only way to establish contact with Get Double would be through their contact submission form. A WHOIS report on GetDouble.online will reveal that GetDouble was registered on January 2nd, 2019 through the NameCheap, Inc registrar. Unfortunately, the site was privately registered so we are still uncertain who is responsible for GetDouble. GetDouble is not a popular investment venture amongst Bitcoin enthusiasts and reflects virtually no feedback across the web. According to SimilarWeb, a market intelligence site, GetDouble failed to reflect any web rankings likely indicating that their site receives minimum sums of traffic if any at all. Is Get Double Too Good To Be True? Yes, GetDouble promotes an investment opportunity that is too good to be true! Blatant Anonymity – It is evident that the creators behind GetDouble.online were trying to remain anonymous and free of any operational liability when developing this scam. Failing to include any identifying information while only accepting Bitcoin payments (which remember are irreversible) are shady business practices to say the least. Vague Operational Insight – There is no enlightening information at Get Double regarding how they are able to double an investors bitcoin within only 10 hours. Sure, they mentioned about their fully automated system working around-the-clock but that doesn’t provide knowledgeable insight as to how their system functions. Does it employ investment algorithms, technical trading indicators, which brokerages are their systems investing through and where are their so-called data centers located? Bad Business Model – The most misleading characteristic regarding GetDouble.online would be their ridiculous claim to double a traders investment within a matter of 10 hours. While they include a payment ledger on their site, we have no means or way of verifying that their system is in fact paying out their users and not their own Bitcoin wallet addresses. To add, GetDouble is built similarly along the lines of a Ponzi scheme. As with similar Ponzi schemes that we have encountered in the past, GetDouble is using a portion of the deposits of newly registered investors into their site to compensate their past investors withdrawal requests. As soon as the volume of withdrawal requests exceeds the incoming volume of new deposits flooding into GetDouble, they will stop paying their investors and close their doors for good. Bitcoin Ponzi schemes don’t tend to have a long lifespan, within a few months we wouldn’t be surprised if GetDouble shuts their doors down. Given the information and the utter lack of credibility regarding GetDouble, it is obvious that their platform is not safe to use and is a scam. GetDouble is a full-pledged Ponzi scheme. We have encountered a couple dozen of these “Bitcoin doubling” operations only to find out that all of them to date have yet to be legitimate or long-lasting. Enticing unsuspecting investors to part with their Bitcoin through the unrealistic assertion that they will receive twice their investment amount in only 10 hours is not only unethical but ridiculous. It doesn’t matter which investment field you are acquitted with, any investment venture that is promoting to double your investment within a 24 hour time frame is likely illegitimate and a fraudulently active entity. Given the facts we shared above, we do not believe GetDouble to be legitimate. We would not be surprised that if you deposit into their platform that you would likely not see your bitcoins again. With this in mind, we are going to bring our review to a close, but we believe our stance is clear regarding GetDouble.online. Verdict: Get Double is a Ponzi Scheme! We invite you to share any insight, experiences or feedback you may have below! if any legit site ??? ?